Ulm, 01.07.1903, Gründer-Namens-Anteilschein über 5.000 Mark, #2, 36,7 x 23,9 cm, blau, beige, Knickfalte quer mit Einrissen, Erhaltung EF-, Auflage nur 24 Stück, uns sind nur die Nummern 1, 2, 4 und 7 bekannt, Rarität aus Sammlungsauflösung, R10! Ulm, 1 July 1903, Registered Founder’s Share of 5,000 Marks, #2, 36.7 x 23.9 cm, blue, beige, horizontal fold with tears, condition EF-, only 24 copies issued. We only know of the items with number 1, 2, 4 and 7. Rarity out of an old collection! R10! The company goes back to an oil mill which was founded in 1697 by Michael Geiger. It was converted to an industrial mill in 1853. The name was changed to Ulmer Rollgerstefabrik in 1897. A turbine was added to the mill in 1898. 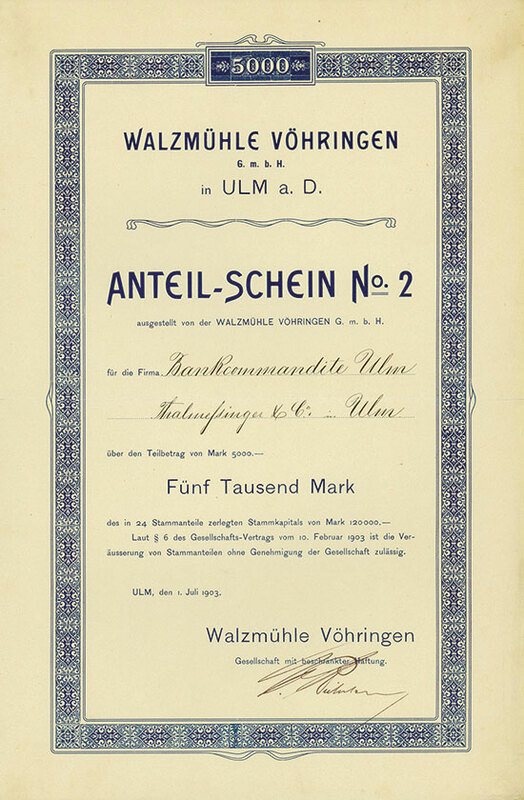 The legal form of the company was changed to Walzmühle Vöhringen GmbH on 10 February 1903. The company had a capital of 120,000 Marks. This capital was divided into 25 Registered Shares of 5,000 Marks each. All shares were in private ownership. The mill was sold by a forced sale in 1914. The mill was owned by Carl Mühlhäuser in 1917. It was decommissioned in 1972 and demolished in 1997. (Source: www.thomas-haas.eu).